There are still a few things to do with this place, but I feel it’s best to iterate things rather than make the whole thing in one go – the best ideas usually come when you have the basics down and let it rest for a day. 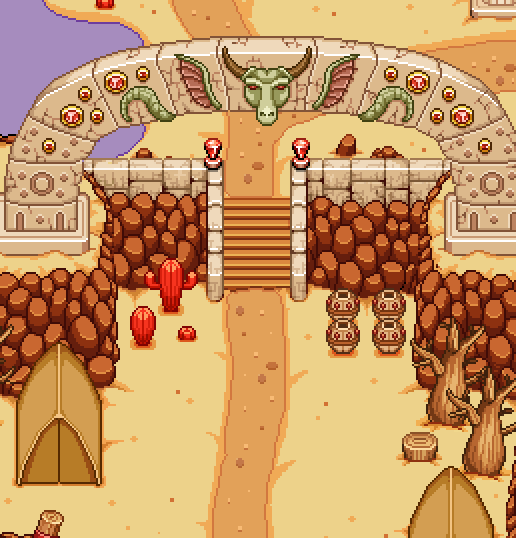 Instead, I’ll continue working on the basic skeleton of the area: getting the walls and general decorations down, before continuing adding props on a more detailed level! And the female gardener from last week gets a husband who’s inside the house stirring.. a pot of water? A bland soup? Who can tell! Above is the first quick sketch of the notification box mentioned. 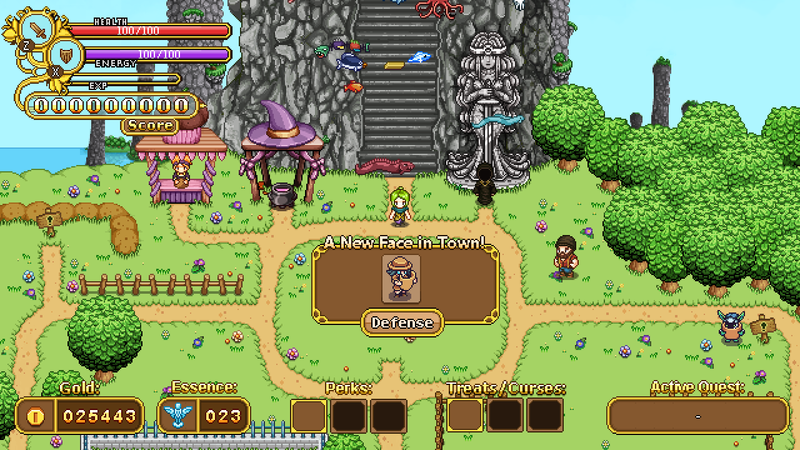 We wanted to notify players of when new characters appear in town so they know what/who to look for. 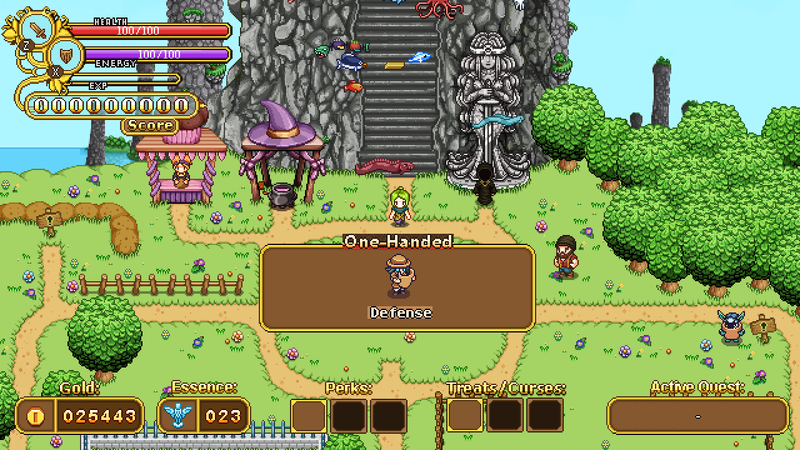 Instead of One-Handed it will say “A New Face in Town”, and instead of Defense, it’ll say the character’s name. We used to placeholder text to get a feeling for how big the fonts are. 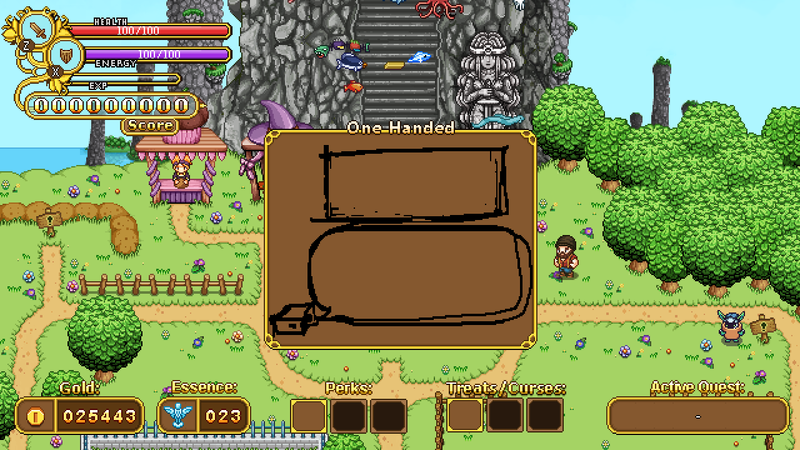 Once more we’ve used a placeholder text to get a feeling of how big text will appear inside the box. 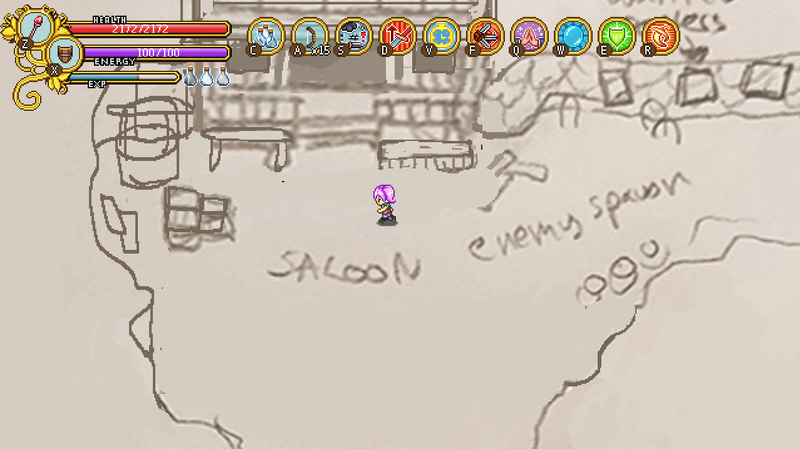 Instead of One-Handed it’ll say the name of the building, and instead of Candy’s line from Pumpkin Woods there will be a description of the house and what can be done there. The coin box to the bottom left of the window will tell you how much it costs to unlock this building, while the checkmark and x will confirm or cancel. The x will be selected by default to avoid accidentally building things you wouldn’t want. The first one being where the floors turn to ice, the second where you’re surrounded by flames, the third being the curse which allows higher level enemies to spawn on lower level floors, the fourth is a curse that makes you take double damage. Above is a screen of Trunk talking to Bishop, during which we realized his portrait is a little too big and feels too close to the text. First mission: make it smaller! Intro Pacing: For new players, Arcadia can be a bit much to grasp in the beginning, and that will be even more true after the rework is complete. 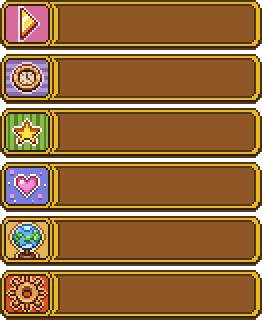 There’s a ton of empty plots ready to be purchased by you, new characters and quirks that are unlocked from the beginning or will appear as you play (such as Candy and Muffin who were scheduled to appear after you’ve reached a certain floor or when you’ve died x times respectively). To pace things a little better, we’ve decided that the first time you spawn in Arcadia, there won’t be any signs near the empty plots describing what they’ll do. Instead, there will be a cutscene where your new partner in crime introduces himself (Trunk), and you’re off on your adventure. The ability to purchase things will only become available after your first death, at which point you’ll actually have some money for the first time: and to further invite people to aim for a plot purchase, a NPC will provide a quest with a gold reward. 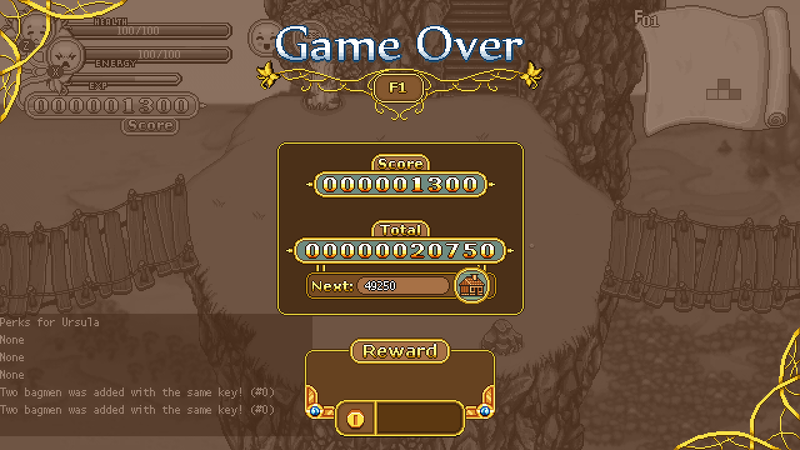 A couple of deaths after that, Muffin will appear to help you out with treats, and after a while (or after you’ve reached a certain score and/or floor), he in turn will have a quest for you, which is to bring back Candy who has gotten lost somewhere. Finishing this quest will unlock Curses. 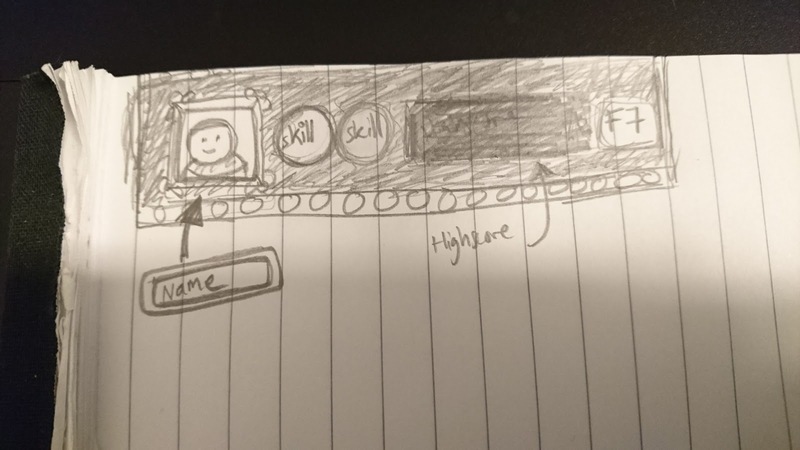 And so instead of everything hitting the player at once (or just randomly), we feel this step by step introduction will be easier to grasp for new Arcade Mode players and sets things up more nicely. 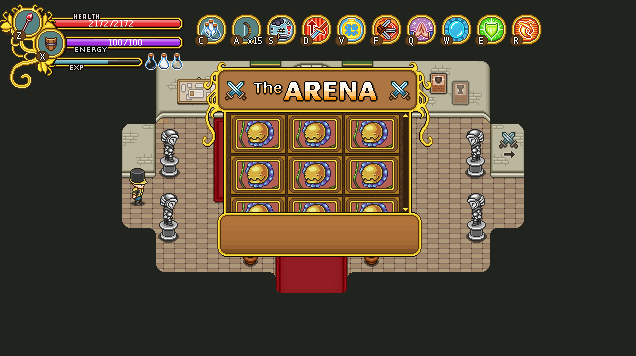 A new type of room: or perhaps, rather, another thing that can happen in event rooms! In some event rooms in the future, there might be a captures NPC tied to a pole or shut in a cage, which upon inspection will trigger a mini boss battle. 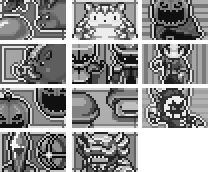 Winning against this mini boss will unlock the captured NPC in your town, where they might just be another friendly face (with a reward?!) or provide new quests in the future. Bishop’s Special Runs: Since some people (ourselves included) have expressed a wish to be able to replay certain extreme challenges, such as Bishop’s “no leveling, all elites” run, we’ve decided to add the option! At Bishop you’ll be able to select these special formats in a list once you completed the original quest(s) where these rules first applied. Next to each special condition you’ll see a mini hiscore list of how far you got (what floor you reached), encouraging you to aim higher next time. While some of these could be curses instead/as well, we decided to keep these crazier versions separate as the game isn’t designed to be played this way; you’re basically not really meant to be able to finish the game with one of these adjustments on, and as such we thought it’d be more interesting to give them their own highscore board where you can see how far you got, rather than an arbitrary score increase. Since we all thought the second one looked better, we’re gonna make some adjustments to the background allowing us to properly use parallax scrolling for all the pillars (as well as add some more to increase the effect). 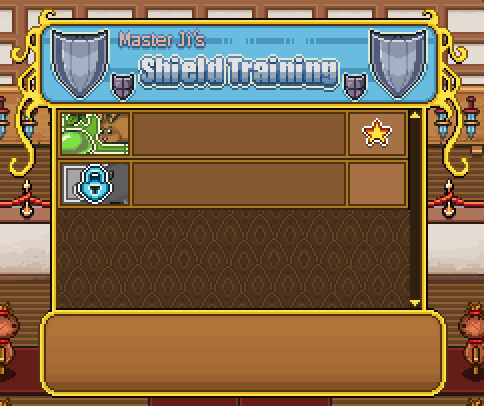 Okay, one of the last interfaces I need to make belongs to Master Ji’s shield training dojo where he challenges you to perfect guard various enemies! Because we haven’t discussed this in detail though, we needed to have a talk and finalize some things. The basic idea with Master Ji’s dojo is that you won’t be able to deal damage on enemies without having perfect guarded them first: after which they’ll die after just one hit. 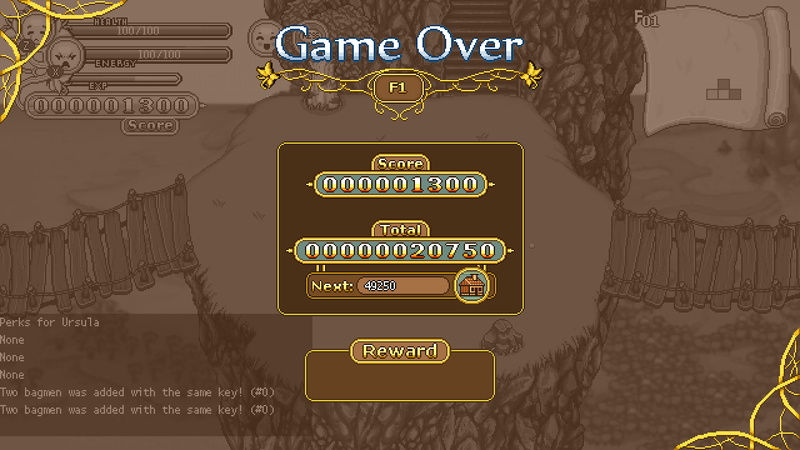 You yourself on the other hand will just need to take a single hit before losing the challenge! The first time you talk to Master Ji he’ll give you a trial run where you have to perfect guard twice: once where you hit the enemy regularly after the guard, and once where you’ll use a skill (in order to quickly showcase how your attacks and skills become better by perfect guarding). Once you’ve done this you’ll be able to select a bunch of challenges through his interface. Each area has their own challenge where you’ll be presented with either one or multiple of the same enemy one at a time until you’ve perfect guarded your way through all the enemies of that area. After that you have to perfect guard against each of the previous enemies at the same time. Complete this without taking damage and you’ll have cleared the challenge. Clear five challenges and you’ll get the first “belt” (a headband of a specific color), ten to get the next and so on (actual numbers might differ depending on how many challenges we have in the final version). Aside from the basic floor challenges there will also be special challenges with interesting enemies, such as perfect guarding against each of Marino’s special attack combo attacks, or being stuck on a platform with Lantern Jacks shooting fire at you. 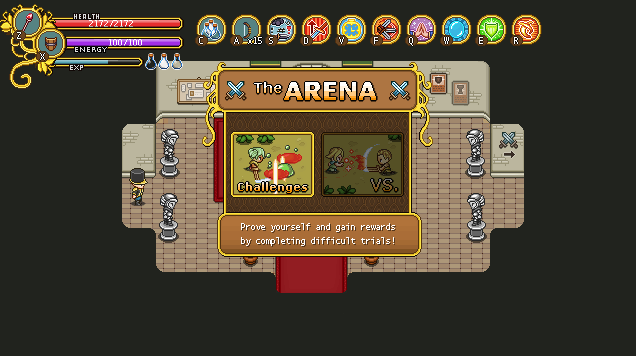 As for availability, the relevant challenges will be unlocked as you reach each area, so you’ll have to have gotten to the Evergrind floors in Arcade before you unlock perfect guard training against those enemies, for instance. However, you can clear the challenges in whatever order you want. In order to make retrying challenges less annoying you’ll get the option to retry (yes/no) after you fail a challenge, where selecting no will simply bring you back to regular Arcadia and yes restarts the challenge. 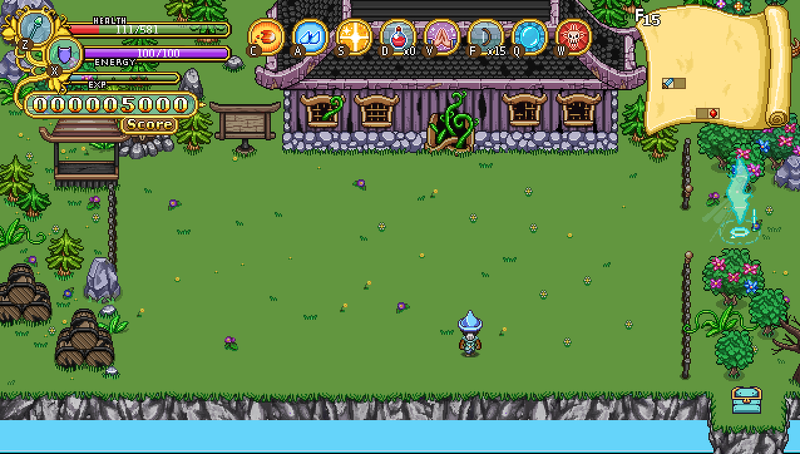 And now, on to actually making the interface! In Fred’s department, this week has been focused on more desert stuff, the place where I will end up very soon as well! 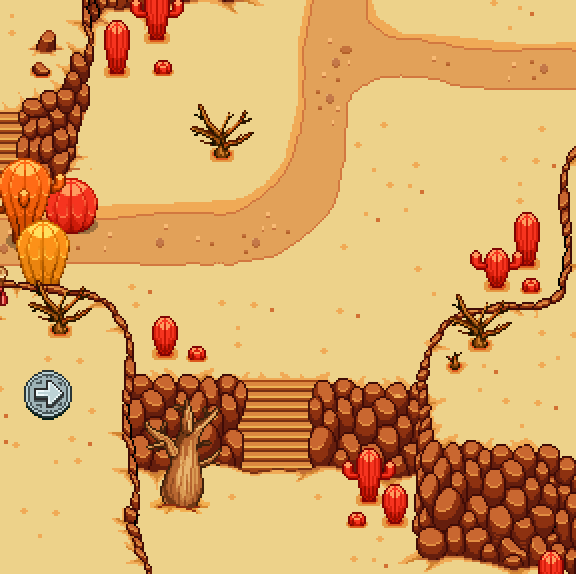 There will be a couple additional enemies as well, though these little guys will only appear in a side quest that we’re working on that will be added along with the desert. 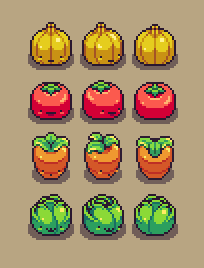 Seeing how cute they are though, we might wanna squeeze them in somewhere else in the game too, we’ll see! 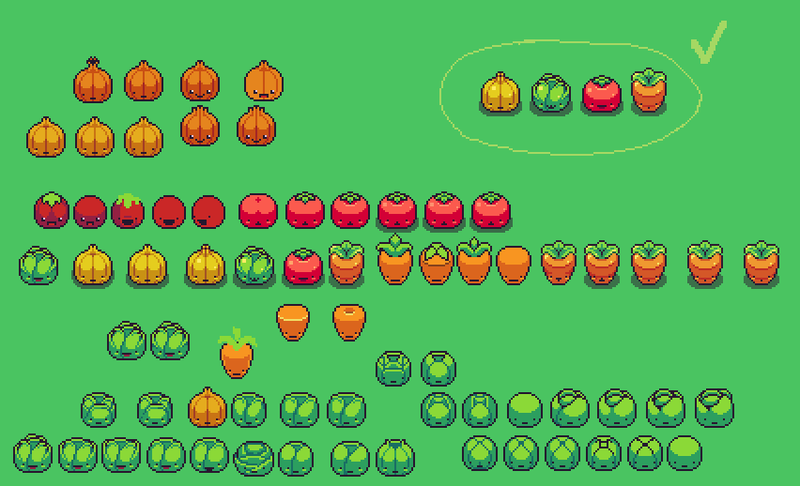 The ones in the top right are the final versions, the rest are various stages of sketches or other variations we decided not to go for. Hope you’re excited to see where you’ll end up meeting this crew! With the new year coming, it’s time to plan new things. For us that means it’s time to start thinking about the harbor town, a place which has been planned for a long time but never sketched and never discussed in greater detail. So that’s what we’ve done now! The Harbor – Obviously a harbor town needs a harbor or it’s not much of a harbor town, right? So we’ve planned a long dock, next to which there are a bunch of ships. Some will look like regular ships, others might have special themes: a viking ship perhaps, seeing as we’re Swedes and all? “Loading Area” – An area next to the dock with a lot of strange crates and sailor carrying stuff and loading stuff onto carts and such. 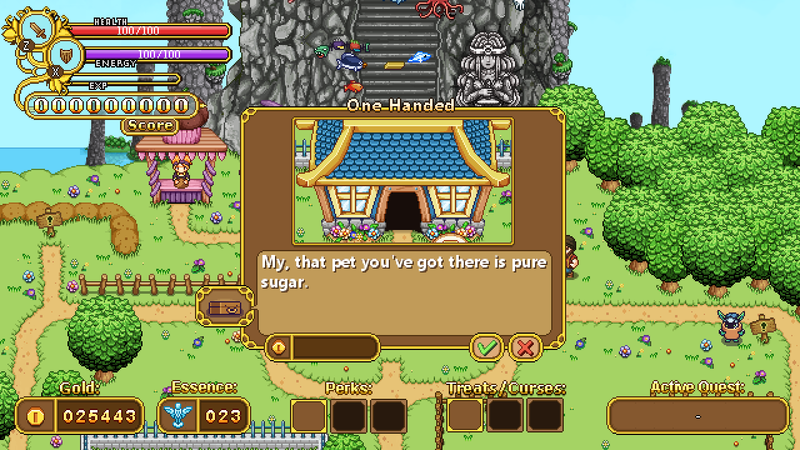 Market Place – A pretty big area with lots of market stands: some where you can buy the usual stuff and gear, some that carry exotic items or fruit for show, to give the area a bit of flavor. The Beach – A small beach with touristy things such as sunbeds and blankets. Tourists walking around enjoying the sand, water and hot weather! 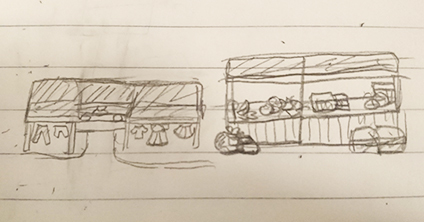 Ice Cream Parlor – Probably next to the beach? But who knows! Anyway, an ice cream parlor filled with tons of ice cream! Probably some tables outside where people can sit and enjoy their treat. 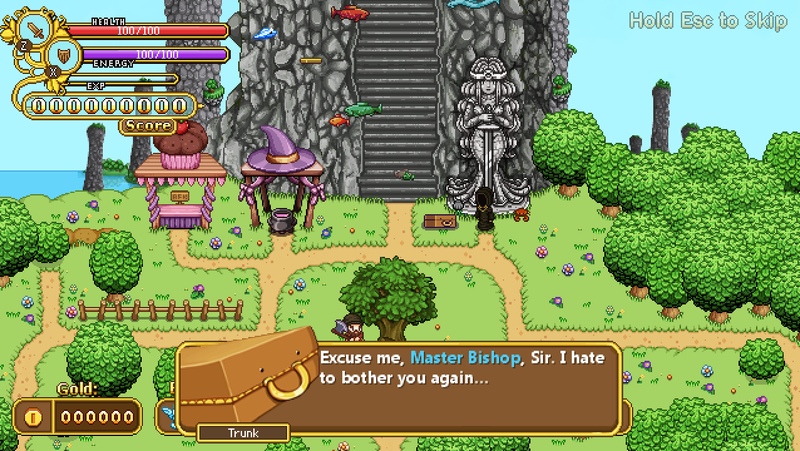 A Church – With Grindea’s statue inside and one of those creepy priests! Houseboat(s) – One or a few, for a more interesting way of living. 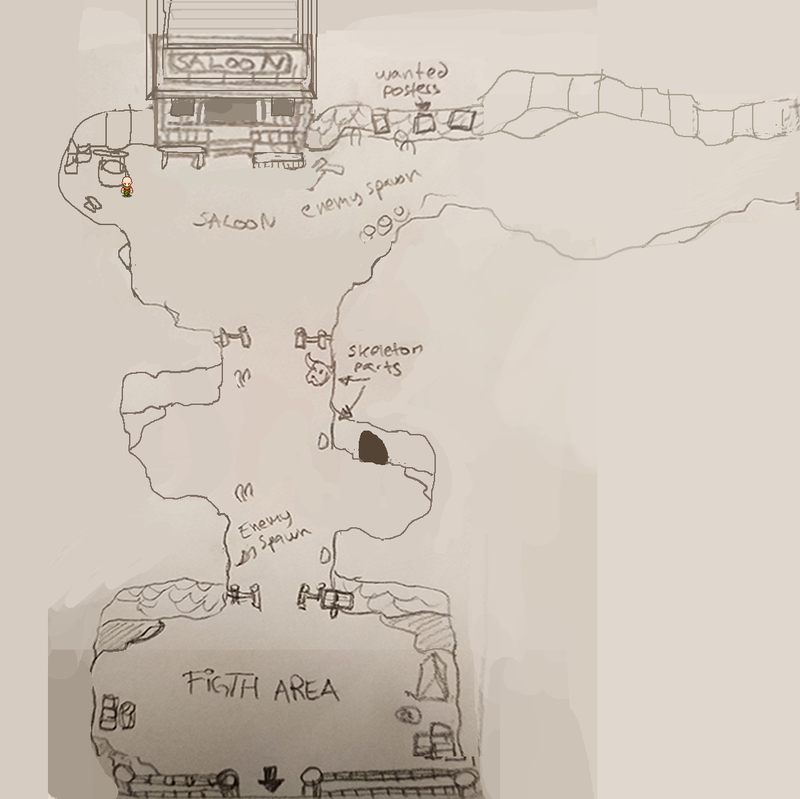 Regular Houses – A few where NPCs live, one of which will be an author which you’ll help complete the final part of her best selling series! We’ll also add this author character earlier in the game, once the library is implemented. We’d like her to have a book signing there in the beginning of the game, up until the festival (or so), for added recognition once you get to the harbor town (where she’s forced to live away from all of her fans so she can finally complete the next book)! 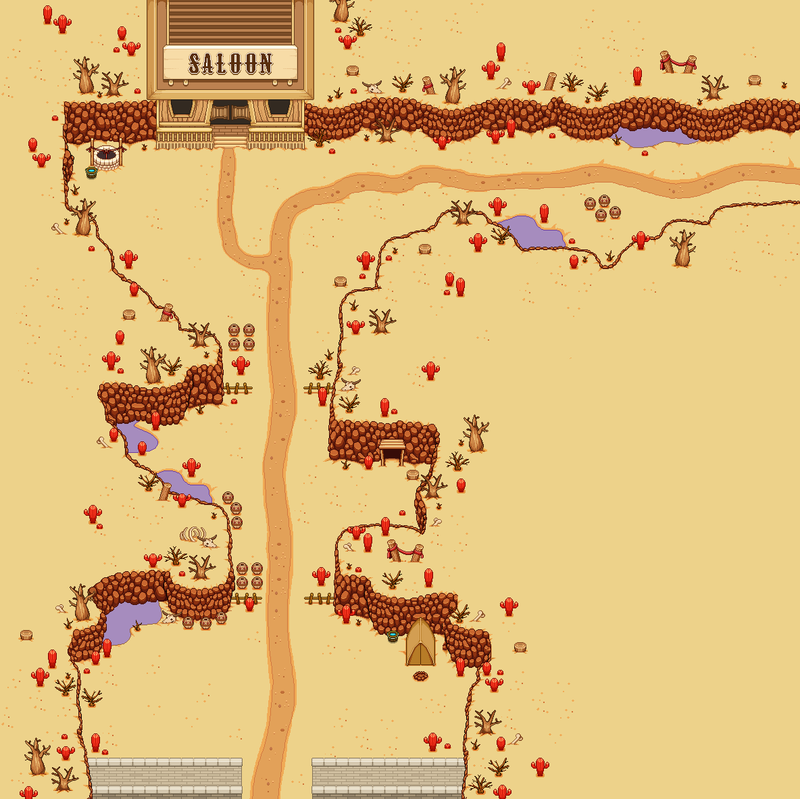 Wells and Fountains – The town is in the desert so they better have water available for the heat! 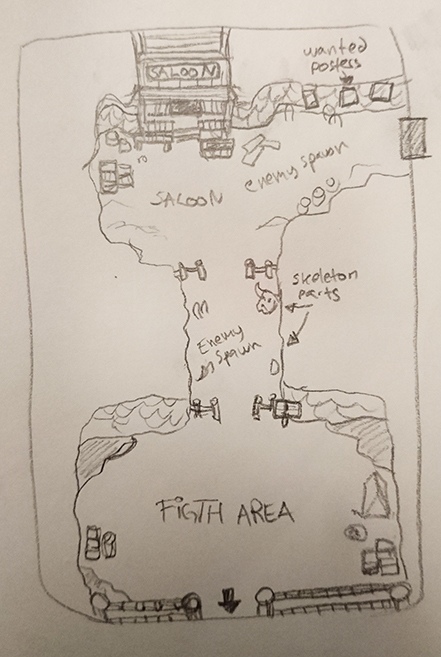 We’ve also been sketching and talking about the details surrounding two big upcoming things: the final desert map, and the interface at the Cinema in Arcadia! 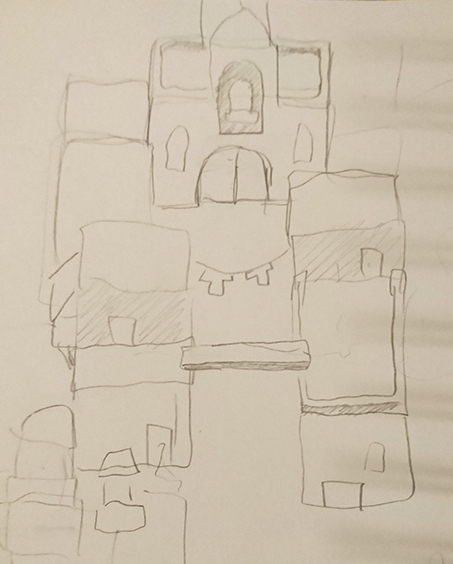 When I made this sketch I paid no heed to character sizes or what the distances between each section of the map would be in the game, as it was a sketch made on paper after all. Now that we need to translate the sketch into something we can actually use, we need to fix that. In the above version of the sketch I’ve brought the whole thing into Photoshop and copy pasted a player character into each section, using it to determine distances and how big each thing is. The result is that certain parts of the sketch have been enlarged to better fit the character(s) that will run through the area. 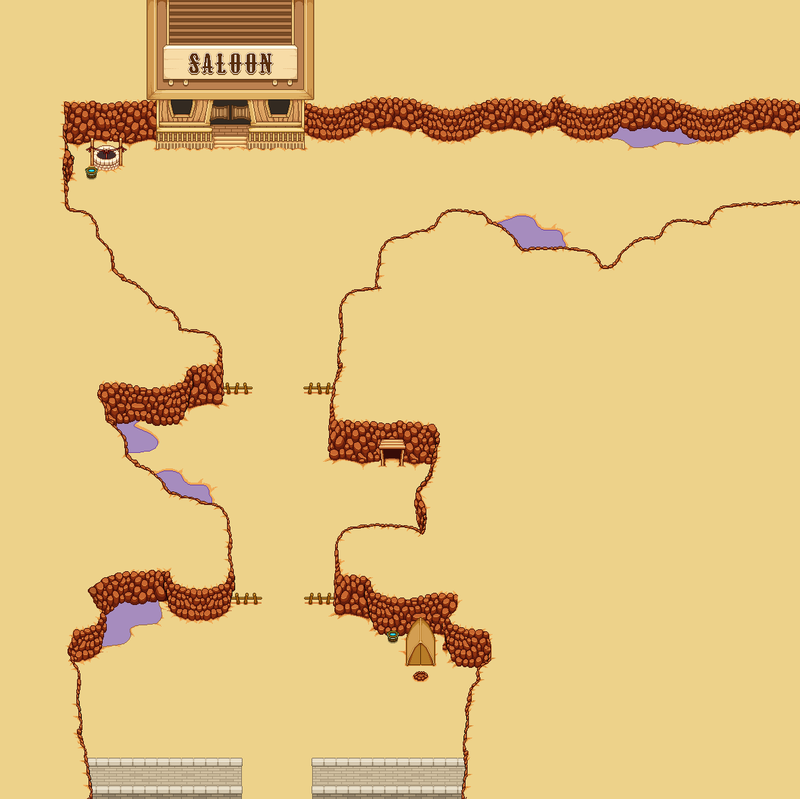 For instance, the part above the misspelled fight area has been a bit enlarged on both sides, and there’s a longer corridor coming towards the Saloon from the top right. 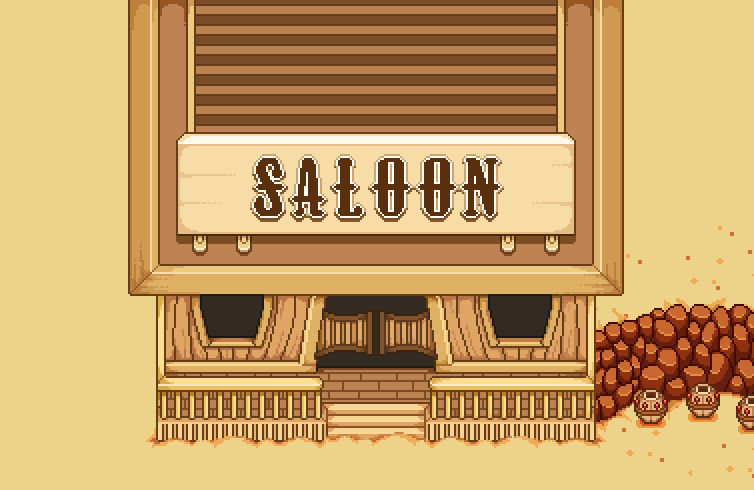 Again, we felt some areas were too small, so we made the corridor before the Saloon even larger and added a small space where you can more easily battle enemies there. 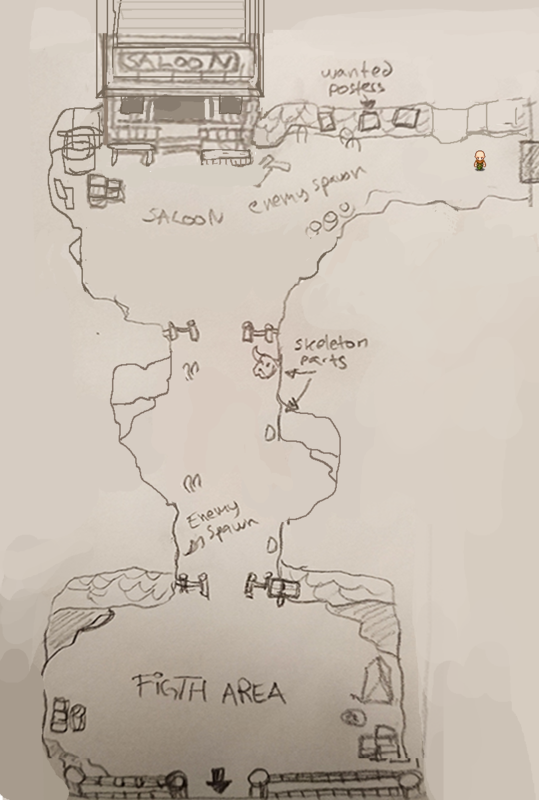 The area before the (still misspelled) fight area was made larger as well, with the option to add a cave (can’t have too many caves and potential extra maps). Finally we actually made the Fight area slightly smaller to give the user interface in the top of the screen more room without it having to completely cut off the walls. 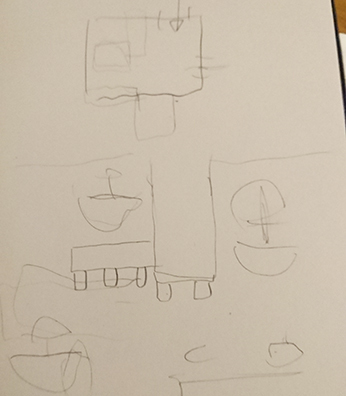 As mentioned, we also talked about the Cinema, how it would work, and how best to make an interface for it. 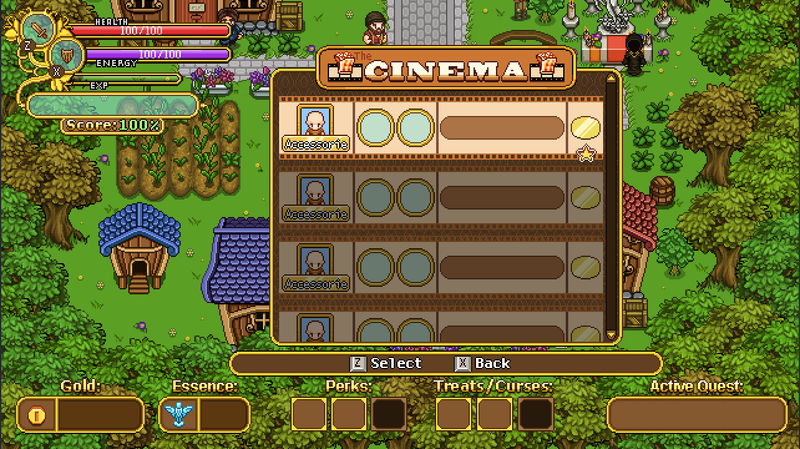 We decided that when you open the cinema interface you’ll be presented with six options: Personal Best, Most Recent, Favorites, Friends, Public and Sharing. In the “Personal Best” section, you’ll be presented with a list of your top best runs, automatically saved for your rewatching pleasure! Same thing with “Most Recent”, but with your most recent runs rather than the best. 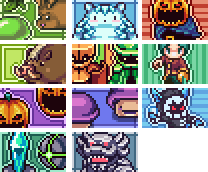 In “Favorites” any runs you’ve saved as a favorite will be available, both your own and those of your friends or strangers: which brings us to “Friends”, where your friends top runs will be available: each friend having one entry each. In Public, you’ll see the runs with the highest scores, and in Sharing you decide whether you want your runs to be shown only to yourself, you and your friends, or if you want them to be public to anyone (i.e if you end up on the high score). 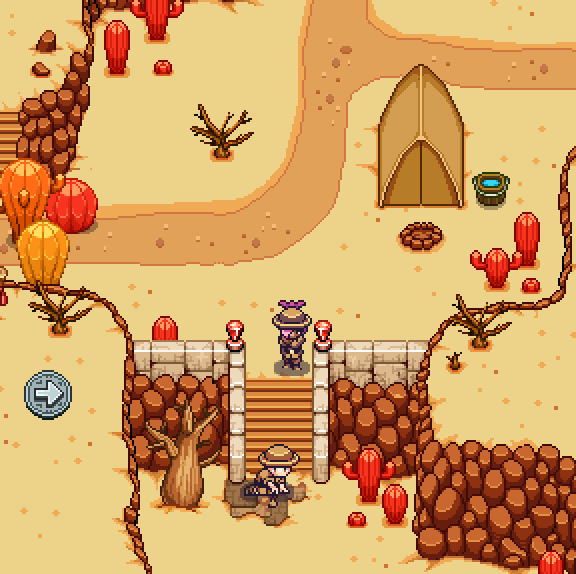 Like most NPCs made recently, you will run into this guy in the desert, where he’ll be busy excavating some new findings (and in doing so, unfortunately blocking your way for a while)! Next week we’ll discuss and continue designing the final interfaces for the Arcadia Rework: the one for Master Ji’s shield challenges, and the UI that shows information about each building you can build. After that there’s mostly some smaller detail stuff for me to do before I believe I’m done with all Arcadia Rework things! Exciting times. We’re back! Hope you guys have had a great holiday, a merry christmas and a happy new year! Now it’s 2018, and as we continue working on and implementing Arcadia rework, it’s only natural that our weekly meeting has a lot to do with establishing the smaller details of how everything will work! In order to quickly get your first building(s) up and running, we’ll add a couple early quests with gold rewards to speed things up and get your into the whole building thing as soon as possible! Some will probably be reused from old Arcadia, while a couple will be brand new. How much gold you get per run/room will be balanced is a tough one, because we don’t solely want it to depend on how quickly you clear rooms (even if they will play into it too, of course). Using only speed as an indicator would mean that certain builds, such as anything involving Insect Swarm for instance, would get a lot less gold vs the builds with faster clear times. To counter this, we’ll award extra gold depending on how long your active time on a run is, meaning if you play for a long while with a slower build, you’ll still get the proper gold reward that quicker builds get. Remember how I mentioned a build time that would count either IRL time or Arcade run time (or a mix of the two where time passes faster if you play Arcade Mode)? 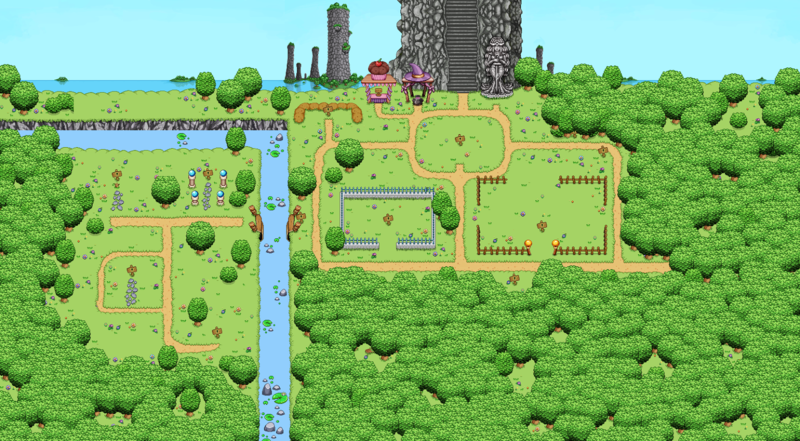 After some discussions, our current stance is that we’ll probably skip build times altogether. This was a kind of difficult decision because we wanted to give players another incentive to play more Arcade Mode (play the game to unlock your building/unlock it faster)! However, you’ve already played Arcade Mode to gain the gold used to unlock the building, so it felt a little unfair that now you have to play the game more before it actually spawns, even though you already paid for it. Instead, we’ll probably use a fade to black effect with some building sounds before you return in front of your fully built property. We’re still not 100% sure about this, and each of us actually have our own preferred version with the fade to black being the compromise. What would you guys prefer? Would build time be a nice or annoying thing? Treat – You start your run with a Time Crystal that rewinds time to when you first entered the floor if you should die. Meaning you get a chance to play through the floor again and fix your mistakes! Keep sharing your best ideas and we’ll see where we end up with all of these! 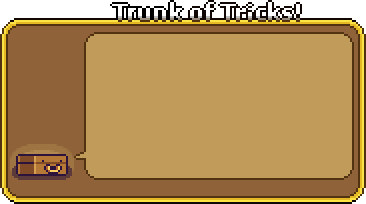 It’s likely we’ll go for this second version as it has room for a lot more enemies and the text box won’t be used much anyway! This is so that you’ll have approximately the right level and equipment for the boss fight (as your current Arcadia character is level 0 with no gear what so ever)! It gives an accurate representation of the fight, as it reflects how you got there last time, and allows you to try out the fight with possibly different builds (if you change playstyle between runs). The main difference between the Lumber interface and the Bank’s interface is that instead of Lumber we’ll deal with Essence (obviously), and that you’ll be able to either buy Essence by handing in gold, or sell Essence and get gold back for it. 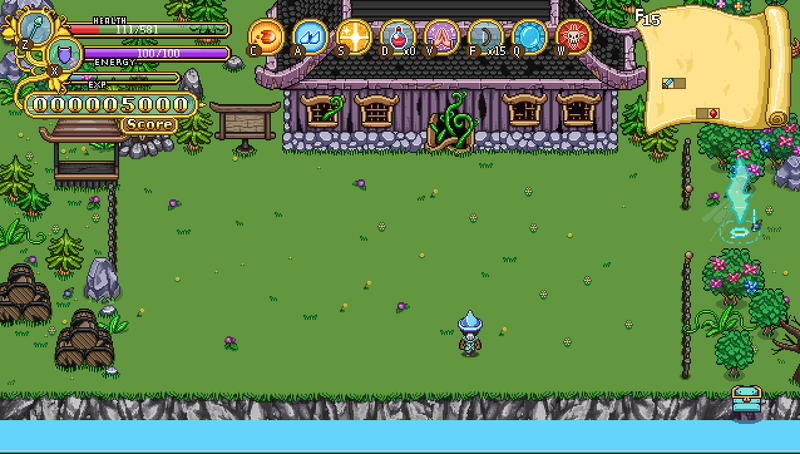 From the beginning we thought we’d deal with both in the same interface (calling it exchange instead), where you’d scroll right to get more Essence and less gold, and scroll left to get more Gold but less Essence (with a symbol for the respective currency on either side). However, we felt it’s probably easier to understand if we just call it Buy/Sell Essence and keep them separated. Here, the Lumbers have each been replaced by an Essence statue. The top box will contain a number indicating how many Essence you want to buy (or sell), the number next to the big coin will let you know how much that will cost you (or how much you’ll get back for selling your precious Essence), and the number next to the Essence-with-a-coin indicates the current exchange rate (which don’t change the way things are designed now, but we thought it might be interesting to know). The small gold coin is next to your current gold total, and the Essence-with-a-bag shows how many Essence you currently own. 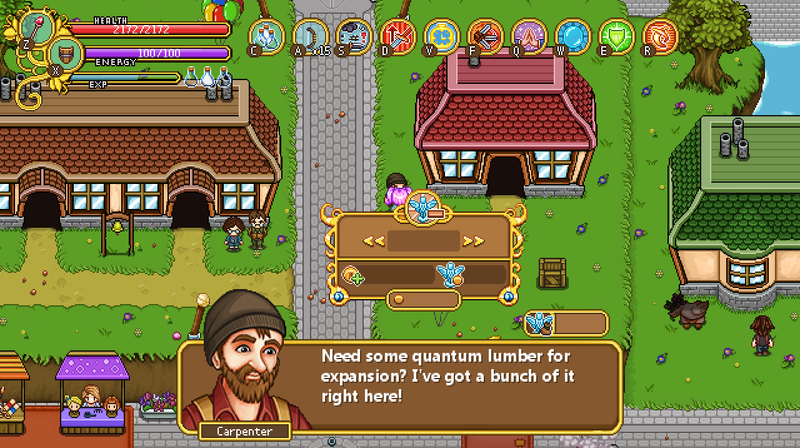 Pretty much like it is in the Lumber interface, in other words! 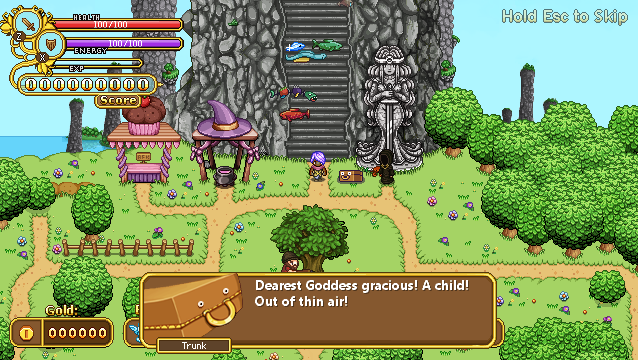 Finally, there’s a bunch of NPCs made by Fred! 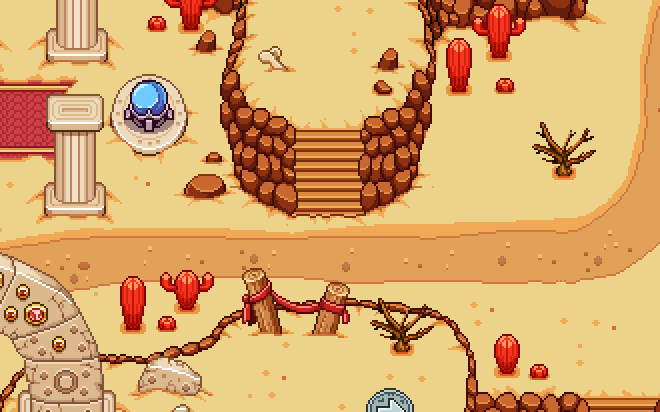 Some of these have portraits that have been showed before, but the two on the right are brand new archaeologists that will be inspecting the old ruins and skeletons found in the desert!